Various org chart examples coming in creative styles are provided to give your inspirations for making presentation-quality org charts. Unlike traditional organization charts which have a fixed style of matrix blocks, these charts are designed with unique ideas and creativities. They are better for making presentations or other visual purposes. All these examples are created with one software – Org Chart Creator. Besides basic org chart card shapes, it also included common diagramming shapes, such as a circle, triangle, oval, rectangle, star, cylinder, and so on. Both flat style and highlight style are provided. There are numerous clip arts and symbols available to use. 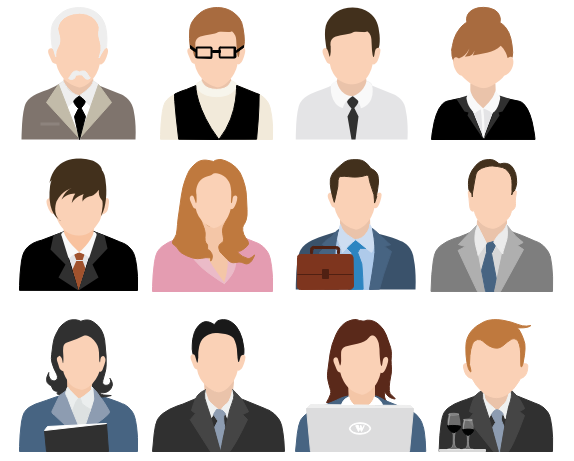 Clipart categories include people outline, people half-length, business, finance, marketing, etc. Great guidance, samples, manuals and videos to help you going smoothly without obstacles. To gain impressive org charts that are unique, you can customize it creatively. Start from easily customizable org chart templates to save both time and energy. Here are some simple ways to gain customized org charts. Org charting becomes easier than before thanks to our org chart creator’s advanced diagramming tools. Our org chart creator offers lots of templates that are easily customizable. Adding shapes is quite easy for the automatic functions. You can move the cursor to show the hidden button which helps you add elements fast. Without drawing skills, anyone can gain org charts instantly. The ultimate goal of organization design is to achieve the strategic objectives. Therefore, the design should aim at serving to reach the goals. It should be designed with the optimal position arrangement that makes the most benefits for the final goals. What’s organization and what’s organizing? Organization: Organization is a group of people who work and cooperate together in order to achieve a particular aim. Identify all business processes involved and make a classification. Divide key processes into groups. Authorize leaders to supervise each group. Make necessary rules and regulations. Long ago, football clubs were formed by friends, workmates, football lovers or sporting associations to enjoy playing the game and competing. But as time goes by, football clubs are becoming more formal, some larger clubs have turned to limited companies. Different clubs have different cultures and ways of construction. 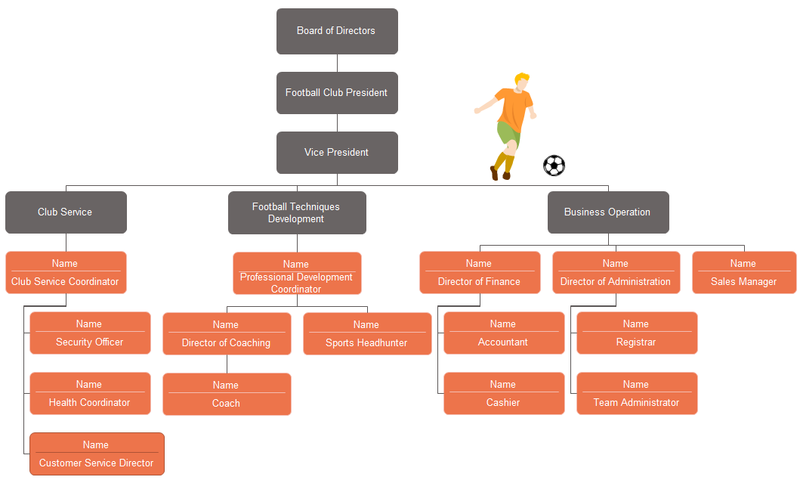 Here is a sample of a football club organizational chart. Let’s see how this club is constructed. Layout org chart properly for a better visual effect which will make it more understandable. Here are a few layout techniques that help you make a better organizational chart. Being organized is the basic feature of a professional-looking organizational chart. Align all shapes to make it look neat. You can do it easily in our org chart creator. It offers advanced tools to help you make org charts that are perfectly aligned and spaced at 1 click. Color can add charm to your charts. 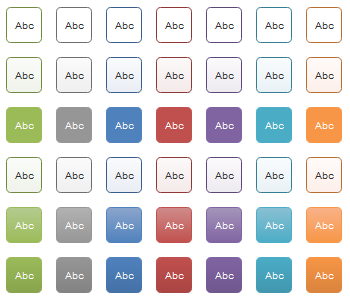 For high readability, it is necessary to differentiate hierarchies or departments with various colors. In this way, readers can learn the structure in an instant. Use the color bar or palette to do it. If you work in the HR team and wanna to make an organizational chart for your company, how would you do it? How to make a quality org chart that is visually appealing? Where should you start? The best way seems to use an effective org chart creator to solve all problems in just seconds. 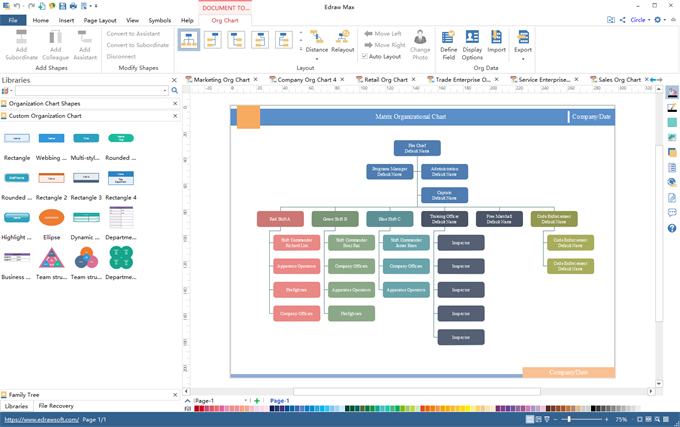 Here we highly recommended the full-featured Edraw Org Chart Creator for you. It has advanced tools, quick start templates and has continuously upgraded for decades. An org chart graphically depicts the internal structure and hierarchies of an organization. It enables one to visualize the roles, relative ranks and the relationships between individuals. It’s also called organizational chart or organigram. Org charts usually use the inverted tree structure, with small boxes representing employees and lines connecting the boxes. The boxes will be filled with staff information such as their name, department, position, etc. The horizontal lines connect employees with the same level, and the vertical lines indicate the reporting relationship between a superior and the subordinate. What to include on an org chart? An organizational chart can be used to show the structure of an organization as a whole or broken down by division or unit. It will include information on the individuals, which you may add their basic information such as name, age, position, department, team, and photo, depending on your own requirements.